Well, actually it was a pretty dull and dutiful Sunday, I spent the entire afternoon at work putting together an audit binder, a time-consuming paper-shuffling project that's a lot easier to do when nobody's in the office to distract you. Mostly done, there's still some last details, but it was a good use of a dreary day. And I did come up with something fun for tonight. TQ was on a late shift today so since our schedules both involved fairly late returns home, we're having dinner tonight, and I've decided that for dessert, we're having a chili chocolate tasting - we both like chili chocolate and I thought this would be fun. I found the two Taza chili varieties, chipotle and guajillo, at a deli near the office when I went in to get an iced tea; I found the Lindt on the way home and decided that I should give the Swiss a chance too. We'll see which ones we like the best! Update: Oops. Tasting postponed due to car trouble. I'm breaking into the Lindt because that's replaceable - the Taza chocolate is a little harder to count on, it sort of comes and goes at the places I get chocolate and I've never seen the Guajillo Chili variety (the Chipotle is delicious, though). And talking about chocolate experiments reminds me of this sort of funny one. I bought this in the airport in Detroit and at first I thought it was Gretzky Crunch. Detroit people do love their hockey, why wouldn't a Detroit candymaker name a chocolate bar after a hockey star? Um...because Gretzky never played for Detroit. OK, certainly not "rotflol" funny, but I was amused by my mistake. It was a very good chocolate bar, though - it was the misread hockey name that caught my eye but it was the graham pretzels (hence "gretzel") that made me buy it. 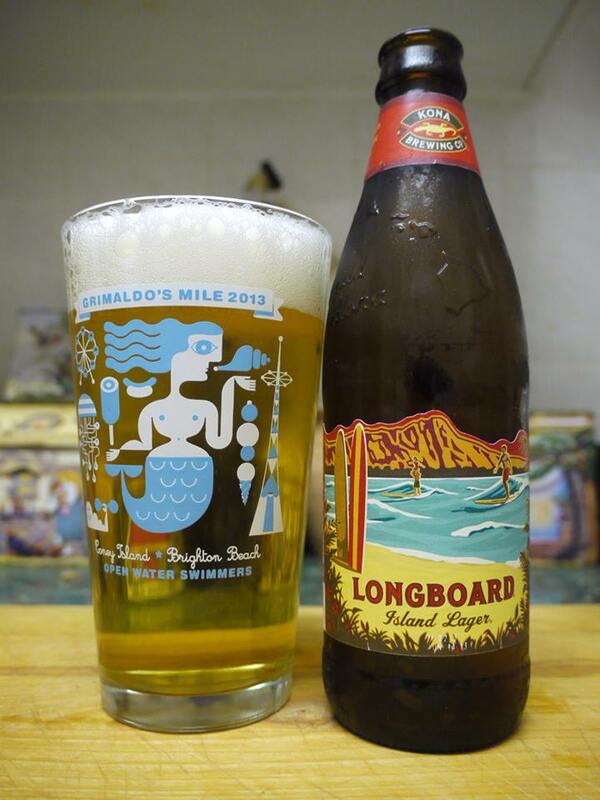 but a nicely-chilled six-pack of Island-kine beer! I hope it's a hit and they keep stocking it - in the past, I've gotten it at New Beer Distributors on Chrystie Street, which has an amazing selection of brews and is actually on the way home if I go home via the Grand Street B station, but they close at 6 and that's usually the earliest I leave work. 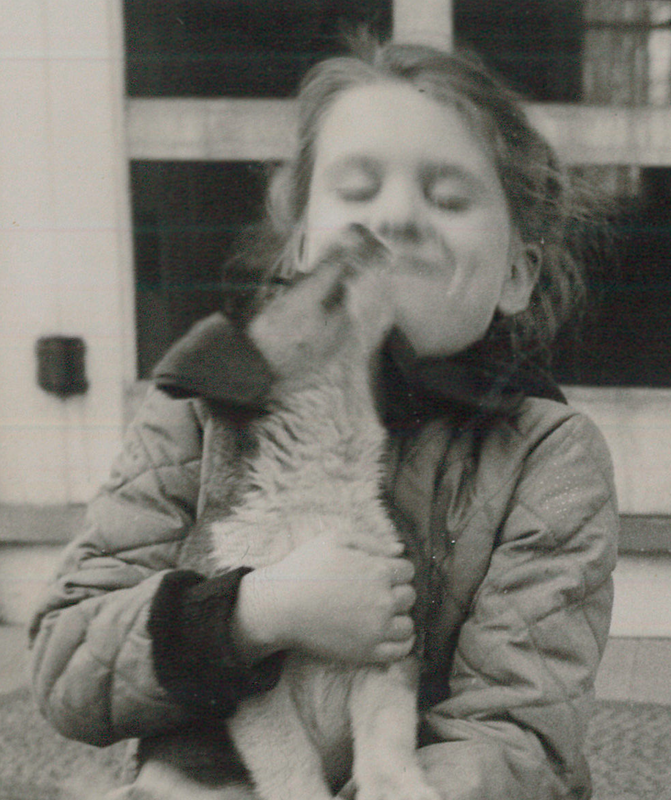 Don't know where this Throwback Thursday thing that people do now came from but I've got a couple of photots that I thought would be cute to post as a pair, from the same set of photos from my Texas aunt and uncle's old home as last week's Fish on Fridays. 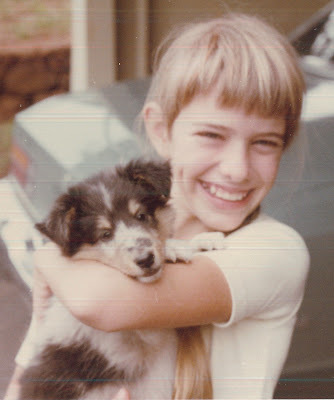 Here's me and my puppy on her very first day at her new home in Aiea in the early 80's (in fact I think we had just gotten out of the car), and my mom and HER puppy, on the porch in Basking Ridge sometime in the mid-40's. Last Weekend's Fun Part 2: Sunday Sail! click on slideshow to go to Picasa gallery with much better versions. And now back to Jamaica Bay, where as of yet we have no ferries to worry about. A knowledgeable friend was telling me that that could easily change someday as the ferry network expands - hopefully if they do they won't be running with the same frequency (knocking wood - I keep old-fashioned non-mechanical pencils at my desk for just that purpose). But for now, the ferry fracas has just made me appreciate my quieter home waters all the more. OK, so I did almost get run down my a powerboat on Sunday, spotted him through the sail window just in time to tack, after which he yelled at me for getting in his way - but that's the rare exception, not the norm at all. The rest of the day was stunning. There were a lot of powerboats out there enjoying the weather, the heat wave had finally broken (SO nice being outside without being drenched in sweat), but aside from the one chucklehead everybody was behaving nicely. We met to rig at 2, which is unusual, we usually head out mid to late morning, but with the full moon we had to wait for later for there to be any water in the bay. I was glad because I was wiped out from the fun but tiring activities we'd run the day before for City of Water Day - so nice to have the morning to recover. Sailing co-chair Jim set our course for the day, he even gave buoys to use because of the lowness of the water; our first leg was a long beat down past Floyd Bennett Field, and that took so long that by the time we all got there there was plenty of water and the markers weren't necessary, but I went and found 'em and used 'em anyways just for fun. We looped around Ruffle Bar in a counterclockwise direction, stopping at our usual beach for a break. The horseshoe crabs were out, the night of the full moon is always the night they come up on shore and do their thing and they were running around checking out everything they ran into. One of our guys a local and has been watching horseshoe crabs since he was a kid - he actually picked one up, told us a little bit about the creature, and showed us how you can tell the males from the females (most of a horseshoe crab's legs end in small pincers, but on the males each of the front pair features a sort of a hook that the male uses to hook on to the female's shell and hang on in the moonlit scrum on the beach). The crab was trying to right himself and when he eventually started getting frantic Jeff ended the lecture and put the crab back in the water. You never saw a horseshoe crab want to get out of somewhere so badly, he absolutely jetted off into deeper water. I found a tiny shell that a younger crab had jettisoned when it got too big - it amazes me that crabs can wriggle out of their old shells leaving them so perfectly intact. I managed to get it back to the club in one piece and the little shell has joined a slightly larger one that I got during one of the first years of 5 Years Around Long Island - they're both in the little built-in curio shelf all of the apartments in my building have somewhere near the entryway now. We split into 2 groups as we left Ruffle Bar, the beat had been long and a lot of people wanted to just head straight back to the basin, while Holly suggested looping around Canarsie Pol. I was tired but it was so pretty out, and I'd been wanting to go see if the ospreys were still in residence (I have this idea that one of these weekends I'm going to Canarsie Pol on my own with my land camera and zoom lens and try to take pictures of birds) so I decided to go with Holly's group. Lovely sail, the ospreys were home, and then when we got back to the club we had a great potluck of cold dishes plus a perfect watermelon. Sunset was stunning and that was our day. Terrific. Kayak-related story going around in the NY media today regarding ferry horns, the paddlers who have been wanting to hear horns when the smaller ferries leave their docks (as is required by Coast Guard Regs) for ages, and a few Battery residents who are throwing a fit now that they are. Frankly, although I'm in thoroughly in favor of people following navigation rules, I might have had more sympathy with the residents if the main instigator didn't indulge in the worst censorship of opposing views I've ever seen on a blog. I myself actually got blocked from even VIEWING batterypark.tv for having the gall to post a link to the regulation in question. OK, OK, I tried to post it twice - once and then again when the first attempt disappeared. The nerve of me, huh? Anyways, I could opine some more, I've certainly found the guy annoying enough to work up a good head of steam, but I got to work late today because of a bit of a personal emergency - nothing bad, just something I chose to attend to - so I've got a lot of catching up to do and I'll just cut to the links. Here's the basic story in the New York Times CityRoom Blog. They didn't go into the censorship and general unpleasantness there as much, that's a column that has space constraints and has to focus on the main issue - the blog crap really was a sideshow and I think Mr. McGeehan did a good job of explaining the actual story. Also made the Talk of the Town section of New Yorker magazine - subscribers only but if you are, you can read it here. 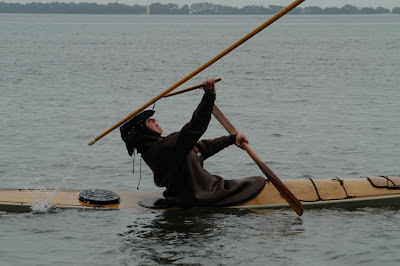 And click here for the viewpoint of a paddling blogger who's taking a far less tiptoey approach to this (but with whom I pretty much agree). On an interesting and sort of disappointing side note, a friend reported that she was by that terminal this morning and the ferries had gone back to silent running. Maybe the squeaky wheel did get the grease, him and his four-member Facebook group. It was a very good day at City of Water Day in Canarsie! It was very hot and a little windier than we like for beginner paddles, but we got a whole lot of people out on the water in canoes, kayaks, and a Sunfish sailed by Holly the Sailing Co-Chair, with safety boat support provided by sailors Jim (the other Sailing Co-Chair) and Chris B. Between them being out there and the relatively sheltered area we have in the Paerdegat Basin, we were able to keep trips running all day. Click on the link below to see a few more pix of the day. I took a few pix during the July Sailing Committee Cruise at Sebago today but this was my hands-down favorite. Lovely day out there, our heat wave has broken and it was SO refreshing to be outside without being drenched in sweat. Great weather for an afternoon sail followed by a potluck dinner. We set out from the club shortly before 3; winds were a bit better than forecast and we had a very nice sail out to Ruffle Bar, our usual lunch break. This was about 5:30, I think, and we were heading back to the club. The wind had died down and as this boat with her striking red sail sailed off, it just hit me that this would make an awfully pretty picture. I like how it came out. It's also a little sad because the builder and sailor of this boat and his wife (who also sails the boat with him quite often, she was entertaining some friends today, they all met us back at the club for the potluck) are two very long-term members of the Sebago sailing committee, are about to move to Oklahoma. They're taking the boat, he was saying today there are some sizeable lakes there and they'll have plenty of opportunities. They are very nice folks, he was one of the many members of the sailing committee who helped me make the not-all-that-easy-but-oh-so-rewarding switch from keelboat crew to dinghy sailor. it's sad to see them go. Me and Mrs. Holcomb, the really lovely neighbor lady at the lake who took me fishing in Texas very briefly at some point in the 70's, and fresh-caught dinner for 8. Not sure which lake, whatever lake it is/was where my aunt & uncle had a "cabin" (really a trailer home but made for a fine lakeside vacation retreat). 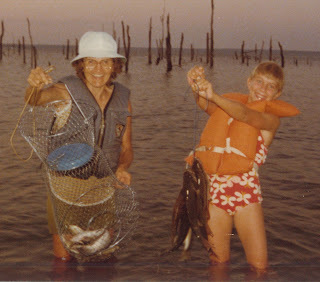 Uncle had a motorboat and fancy fishing gear but I never caught so many fish in my life as I did when Mrs. Holcomb decided to take me under her wing during one vacation up there. She fixed me up with a plain bamboo pole with a bobber and we would seine for minnows for bait and then we would go out in her little aluminum skiff and catch largemouth bass until we had enough for dinner for all. Good memories from my aunt & uncle's old home in TX, my mom sent a lovely set of photos along after they went down for my uncle's funeral. Again, so glad we got in that good visit in December. Busy week here but just can't resist sharing this one. No aquatic mammals were harmed in the making of this video, although I do hear that the Society for the Prevention of Cruelty to Pool Noodles is circulating a petition. Gosh, July's just flying. Very busy time at work plus many, many weekend activities - not much time for futzing around online. However, I found a few minutes in the evening on Sunday to finally get my video snippets from Adam Hansen's harpooning class at the Hudson River Greenland festival strung together and posted to YouTube (I'd had several unsuccessful tries before I remembered that you have to export an edited QuickTime movie to a new version before YouTube will pick up the whole thing). Our instructor is the last thrower of the set. The second to throw on the first clip, on shore, and the second on-water harpooner is Noah Nochasak, an Inuit from Labrador who is working to reclaim the cultural heritage of the qajaqs that had belonged to his grandparents but largely lost to the people of his father's generation. It was a privilege to get to be in this class as Greenlander Adam Hansen taught Noah to use the norsaq. I signed up for this class because a) I don't get much chance to do it in NYC but I actually enjoy target practice when I get the opportunity - remember how the first thing I did in Estonia was archery? - and b) I wanted to do something totally different after spending all of the first day fighting to get back the forward-finishing rolls I used to have but lost through lack of practice, and I had a great time, but when it comes right down to it I would have to admit that it was really just for fun. For Noah, it was much more personal; I particularly saw that when he looked at the norsaq and spear in his hand right at the beginning of the class and said, "My grandfather fed my father this way". It made for a great experience. First off - here is a norsaq that I have here at home (a trophy from the FIRST Hudson River Greenland Festival, if I can brag just a teeny bit). This one isn't quite a functional implement for throwing a spear, it's really just for rolling practice, but it does give you the general idea. The harpoon shaft rests on the groove down the center while the notches give you a good secure grip. What a working norsaq would have that this one doesn't is a couple of holes at either end, into which you would slot corresponding pegs that are built into the shaft of the harpoon, midway down so that the harpoon balances nicely on the norsaq as the paddler winds up for the throw. Here is Adam showing us how to set the harpoon on the norsaq. The pegs fit just snugly enough to hold the norsaq to the shaft as it rests on the deck of the qajaq and as the paddler picks it up, but loosely enough that the harpoon readily parts company with the norsaq when thrown. Here, Adam is explaining the layout of the gear you would have on deck for hunting. 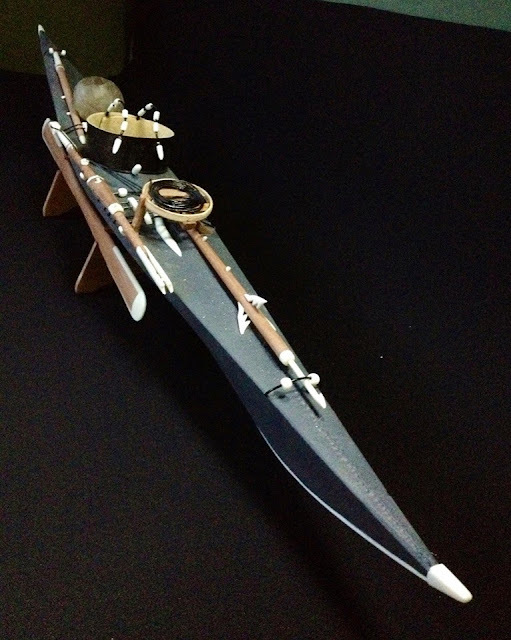 Here is an incredible model qajaq crafted by Ole Karlsen of Aasiaat, Greenland and brought along by Adam for the silent auction that helps fund the event, letting the organizers bring in such good people without setting a prohibitively expensive entry fee. The model is fully outfitted for hunting. The bow of the qajaq is facing the camera; on the forward deck there is a bird spear (note the small pegs on the shaft, those are the pegs that would hold the spear to the norsaq) and a coiled line held in a tray to ensure that it runs freely. That line would be attached to the harpoon, which you can see is supported on rests on the starboard side of the craft (would be port for a left-handed hunter). The point faces aft, and the norsaq is attached to the shaft and just at the right place for the hunter's hand to reach down and pick it up; the motion of the paddler's arm as the norsaq and spear are lifted from the deck brings the business end forward. On the aft deck, there is an avataq (a sealskin float that is also attached to the harpoon line to keep the quarry from diving or at least help the hunter keep track of it) and then another short lance that I believe Adam said that the hunter would use to finish off the quarry if the initial harpoon strike failed to do so. Permission to use photo kindly given by Ed Lamon III, one of the terrific mentors at the event and the happy winner of this beautiful little model. Here's Adam demonstrating the throw - he started up on dry land so that we could get the feel for it without having to handle boats as well. I like this shot because it really shows the way the norsaq acts as an extension of the arm, increasing the leverage by a lot. Once we'd practiced on land and gotten comfortable with the motion, we got in the boats and went after that poor pool noodle with a vengeance. Adam had us practice as though we were actually hunting - that you could see in the video, you would approach quickly and quietly and then as you got within range, you would allow your boat to glide as you picked up the norsaq and harpoon from your deck and made your throw. There's one of the few pictures of me from the festival this year - thanks John T! and I'm putting up this one, taken by the event photographer at a Sweetwater Kayaks Greenland week many years ago in St. Petersburg, FL, just because it's fun and beside, Google actually gave it to me when I was googling images for "Norsaq" before I remembered that I have one here. City of Water Day - Saturday, July 20th, all over the city this time! So I have just been kvetching about the heat over on Facebook (very mildly, I just said that I ran errands tonight except that because it was so hot I really more moseyed errands - did get some stuff done though) and that reminds me that I haven't done my annual "City of Water Day is coming!" post. Because on a hot & sticky July day in NY, one of the best places to be is on or by the water. And you don't have to wait in line for the Governor's Island ferry to get to the City of Water this year. The main event will, as usual, be held there from 10 to 4, and I'm sure it'll be as much fun as it always is (a couple of posts from other years, just as a sample - 2009's City of Boats Boats and More Boats and City of Water Kids), but this year there are also going to be a number of smaller events in other areas, including at the Sebago Canoe Club in Canarsie where we'll be taking people out all day. There will be events in all five boroughs (and of course the "Sixth Borough", that goes without saying), plus Hoboken and Yonkers - and it's not just kayak and canoe trips, if that doesn't happen to be your cup of iced tea, there are arts and crafts, music, tours, and all sorts of other things to do. Personally, if I wasn't going to be on the water at Sebago I think I would go play with radio-controlled model boats on the Gowanus and then head back to the GBX for a tour of the historic ferry Yankee (above) - that's where I was posting pictures from the last couple of posts before my Coney Island pictures. I did poke around some but only in the obviously public areas; there was going to be a tour, but the lecture ran long and the Manhattan crowd had a certain ferry they really needed to catch so that got cut (it was still a very nice little adventure for a work night, though). For full details on all of the events, click here: http://www.cityofwaterday.org/neighborhood/. Should be a fun day! Life's a beach. A dozen photos from Coney Island plus bonus B&B video! As usual, click on pictures for better views. Early afternoon at Grimaldo's Chair (I went to swim, I swam a mile and change and then came back and got out my camera). Looking down Brighton Beach towards Coney Island Beach. Coney Island Beach with Coney's 3 iconic old rides (Parachute Jump, Deno's Wonder Wheel, and the Cyclone) visible in the distance. Shepherd keeping watch (that's one of the lifeguards out there on the yellow paddleboard, keeping an eye on things from the outside). Parachute Jump. Haven't seen the new light show yet, hear it's pretty fancy! B&B Carousel - just opened on the Boardwalk after a five-year renovation. Have to come back with my better camera to do this justice. Waikiki Surfer (fka GregandKris from Love and Coconuts, they moved to Hawai'i - well, mostly, it seems like poor Kris is doing a lot of shuttling back and forth to Portland but Greg's all settled in and doing lots of surfing, water kind not internet!) got me all envious (even more than usual) yesterday when he posted on Facebook "Kalua pig, straight from the imu!". A little bit later he admitted that he had named his slow-cooker "Imu". Story now on his blog. 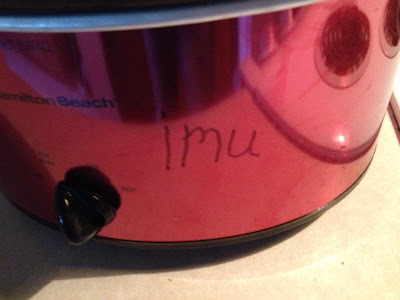 So I figured that he can name a crockpot "Imu" (would that be "Imu Ui'la", electric imu?) then I can call my Dutch oven my "Imu Hao" (iron imu). Whatever you want to call the pot - this is pernil, and I think it's gonna be pretty onolicious (tasty)! REAL imu (in case you didn't already know and hadn't guessed). Vintage Hawai'ian postcard, 1950's, found on ebay, still for sale! Just a few more pictures from the trip over to Red Hook tonight - I took a lot and I'm starting this post too late to really feel like writing (sooo sleepy). Our original destination was supposed to be Hoboken, but then our actual destination in Hoboken suddenly wasn't in Hoboken anymore -- something about Homeland Security, didn't get the full story but with a little less than a week's notice, we were going to Red Hook instead. Unfortunate for our hosts that they had to move so abruptly, but dealing with such things is rather sadly something that our local caretakers of antique vessels get to be fairly good at dealing with - it happens, quite literally, to the best of them. Personally, the change of venue made things a little tricky for me as the new departure time and place was 5:20 at the Wall Street ferry terminal, a little earlier and a little farther away from the office. I was going to leave the office at 4:30 but ended up gambling with my transit time to finish a project for the boss -- said to myself, "OK, I know where the ferry terminal is, if take the time to look up the contact number and the actual address in case I miss the ferry, I'll almost certainly miss the ferry, might as well just bolt and see if I make it". Fortunately both trains I needed to turn up right away both turned up right away (boy did I feel lucky, that NEVER happens) and then after a bit of broken-field running through the tourists on Wall Street I got there with a whole 5 minutes to spare. Woohoo! As usual, click on the pictures for a nice full-screen view. Tug Cheyenne, northbound on the East River, heading for the Brooklyn and Manhattan Bridges. On the grounds of the Gowanus Bay Terminal. Glad to have a chance to get some up-close photos of this old grain silo. I've seen it from a distance a lot but never made it down to the area (and wouldn't have been allowed to enter even if I had). Repurposed bulk carrier the MV Loujaine. Not our destination but also a neat thing to have a chance to take some pictures of. More to come, probably over the weekend. Click here to read an interesting Waterwire article about the Gowanus Bay Terminal, the old silo, and the MV Loujaine. little kitty, BIG KITTY. Scenes from a mini-adventure, part 1. And we went to IKEA for Swedish meatballs and pressboard furniture! Yowza! No, no, no. I'm lying. We were on our way here. At my Aunt K and Uncle B's home in Jonesville, Michigan. This small octagonal window is next to the side entrance to their home and looks in on the family room. 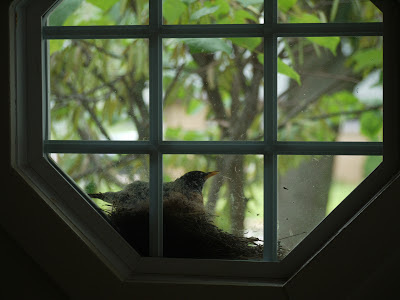 My aunt had noticed the bird trying to build her nest there, she kept bringing twigs and the twigs kept falling on the ground until one day they didn't. 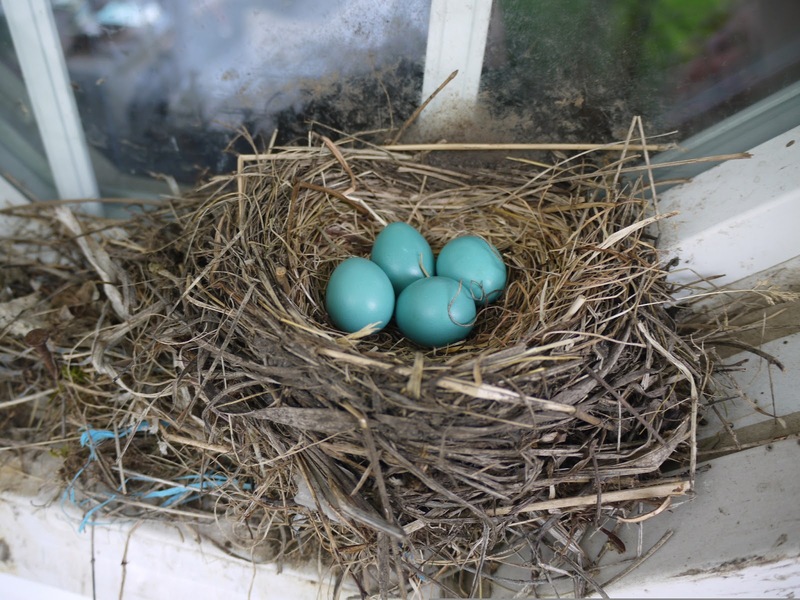 It turned out that my uncle had decided to help the robin out a little and had driven four big nails in along the front of the windowframe. 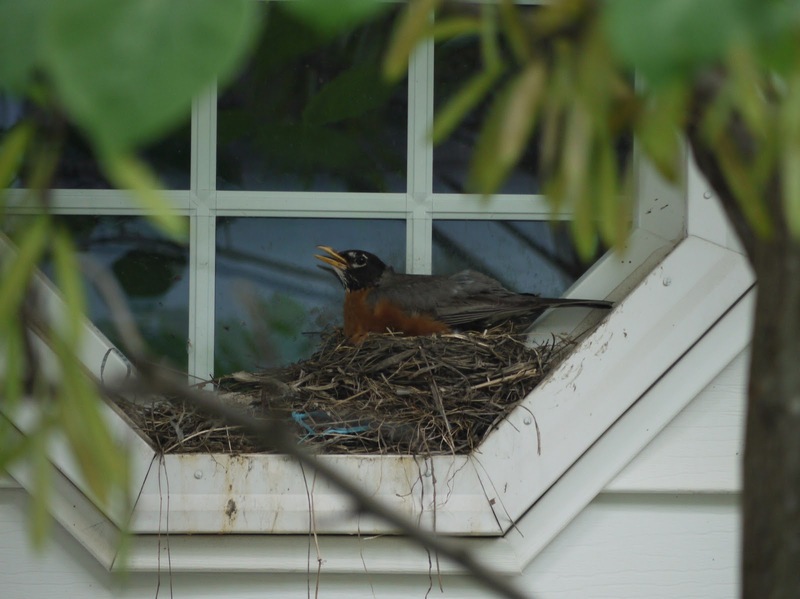 My aunt says he gets to clean the window when the robins are done, but they're really enjoying having her there. There was a lot of coming and going close to the nest with all the visitors in town for Uncle B's 80th birthday. The slamming of the screen door would send her away, but some of us started using the front door more to give her a little more room and she was still sitting tight on the day that we house guests were all leaving. Very neat to have a chance to take pictures like this! 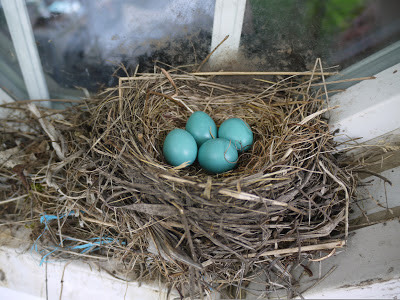 Reminds me of another robin encounter at the same aunt and uncle's place - from Summer 2009. Why yes, I Do Like Sailing, And Pina Coladas Too.